It was a big night for the filmmakers behind 12 Years a Slave and Gravity at the EE British Academy Film Awards help on Sunday at the Royal Opera House in London. When accepting the night's top award, McQueen noted that there are "21 million people in slavery now as we sit here. I just hope there will not be another 120 years of ambivalence that allows another filmmaker to make a film like this." Ejiofor hit the stage with the mantra "wow wow wow" to huge applause and whistles from the audience including fellow nominee [Tom] Hanks. "I want to start with Steve McQueen." He thanked him for introducing him to the character and making a work of "such value and worth to all of us". 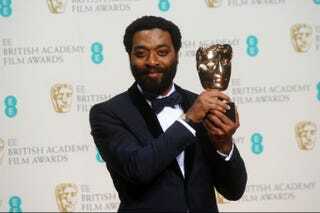 "This is yours, I know it, you know, but I'm going to keep it, that's the kind of guy I am," said Ejiofor. Alfonso Cuaron won for Best Director, thanking Sandra Bullock in his speech. Cuaron said he is considered a part of the British film industry, despite "his accent." The filmmaker, who lives in London, joked that he makes "a good case for curbing immigration"
He thanked Sandra Bullock, who "is gravity." "Without her it would have been nonsense," Cuaron said. Gravity won six awards out of the 11 it was nominated for, winning for Cinematography and Outstanding British Film among others. The Australian actor dedicated her speech to Hoffman, who died on 2 February, calling him a "monumental presence" and celebrating "your monumental talent, your generosity and your unflinching quest for truth not just in art but in life". Jennifer Lawrence and American Hustle had a pretty good night, too! American Hustle, with director David O. Russell, cast members Amy Adams, Bradley Cooper and Christian Bale among the attendees, won three BAFTA Awards including original screenplay for Eric Warren Singer and Russell, make up & hair, and supporting actress for Jennifer Lawrence. And yes, don't worry. I got your picture of Lupita Nyong'o from tonight. I wouldn't let you down like that. There's lots more on tonight's winners here and here.